The poster sessions are social gatherings for participants to get to know one another. These are opportunities to share your stories, your work, and your passion. There will be two poster sessions; half the participants will display posters on Sunday evening, with the other half on Tuesday evening. Participants displaying posters are encouraged to stay close to your posters to answer questions; those not displaying posters should peruse the posters on display and engage the presenters in conversation. Each YGL should prepare a 30”x40” poster highlighting your story and your work. Your name and the poster title should appear prominently on the poster. The posters will be affixed to foam boards and placed on easels. The posters can be formatted in landscape or portrait orientation. If you have a PowerPoint presentation you typically use, you can usually fit six slides on a 30”x40” poster. 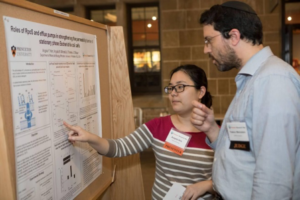 To the right is a photo from the 2017 Princeton Research Day during which a researcher is presenting her work to an audience. You may either print your poster in advance of the conference and bring it with you, or you may send your formatted poster, in pdf format, to acee-ygl@princeton.edu by June 30, 2018. We will print it for you.